As a prepper, your pantry is well stocked. Your home reasonably secure. Unless you must, you have no desire to bug out. But what if you had to bug out during a riot or time of civil disorder? Your home is ablaze. You must flee. Your car is ablaze. You must flee on foot. What two guns would you take? For me, the choice is pretty clear. You’d want your best defensive rifle and your best defensive pistol. The rifle gives you the most range and firepower. The pistol is a lightweight backup. Both should be reliable and magazine fed. You want to own at least four or six magazines for each. What about a shotgun? Sure, it’s versatile. But shotgun shells are heavy and bulky. This is one reason the military favors the 5.56 mm. You can carry much more 5.56 mm ammo than 7.62 NATO. The shotgun loses effectiveness rather quickly. This is one reason police departments prefer 00 buckshot over Number 4. The larger pellets give better penetration. By the time 00 buckshot reaches 50 yards, its lost about half its ability to penetrate pine boards. It will only penetrate about 2″ of pine at that distance. This is comparable to a small caliber pistol like the 25 ACP up close. The second weapon is your defensive pistol. Why? Because you can’t carry anything larger without being weighed down. This is your last ditch defensive weapon. What if you’re bugging out to the deep wilderness and other people simply aren’t around? Defense might not be as much of a concern. If big game is plentiful, a good bolt action rifle in 308 Winchester would be a fine choice for your first weapon. For hunting small game, a small 22 LR revolver or autoloader could be a second choice. One of my favorite handguns is a small 22LR Smith & Wesson “kit gun” with a 4″ barrel. If you’re far North and want a handgun capable of taking larger game, a 44 magnum revolver would be an alternative. Another possibility is to keep your defensive pistol. You just never know if you’ll need it! What two firearms would you choose for bugging out and why? A surfing contest in Huntington Beach turned into a minor riot. For those people crazy enough to try to achieve the one-handed pull-up, this site gives a neat idea to build a “cheat” mechanism to help you build up to it. The pulley and weight will only allow you to use your other hand to a limited extent. As you lighten the weight, you’ll get closer and closer to your goal. Very clever. Here are ten exercises you can do from a pull-up bar. Actually, only about seven. The last few “back levers” and the final stretch look like exercises best avoided by us average Joes who don’t want to mess up our shoulders. But the leg raises and earlier stuff looks good. Aging preppers face several challenges. Shooting provides a good example. As you age, you eye’s ability to accommodate different distances decreases. Most good shots have eyes that can rapidly shift focus from pistol sights to the target. Poor eyesight can be corrected with glasses. An inability of accommodation cannot. You can choose: Do you want to see your target clearly or the sights? For practical defensive pistol shooting, one possible solution is to work on point shooting. You won’t be accurate at longer distances, but you’re most likely to need a pistol up close anyway. For rifles, the answer is easy: Scope them. A good low-power scope (Weaver Classic V-Series Rifle Scope 1-3x 20mm or similar) should sit on all your rifles if you need it. Even a 30-30. Making a take-down bow from old skis. (part 1 of 2). Here’s an interesting development. Scientist have learned to create false memories in mice. The scientific advancements are great, but where will this technology lead in the future? If you want to combat aging, this article summarizes 8 things that help your cells rebuild. Pomegranate juice. Green Tea. Stuff like that. Tracking car movement by reading license plates. An interesting article about the use of drones and how it’s probably creating more enemies for America. Here’s an interesting article about water pasteurisation (pdf). Personally, I like boiling much better. But if you’re seriously pressed for fuel, this might be something to consider. Always have a bail out plan. I stumbled upon this tutorial for the American Ninja Warrior warped wall. If you’ve ever wondered why these blokes don’t just fall backward and crack their skull open, this shows you how they bail out. If you undertake anything dangerous, you need to know how to bail. Here’s an interesting video by Rich Pin about installing a trailer hitch on a small vehicle. Two important concepts for preppers to integrate into their lives, or at least their prepping, are serviceability and simplicity. Serviceability means you can service the mechanical items you rely upon. Firearms and vehicles come to mind. Are you sufficiently familiar with your firearms and vehicles so you could maintain them if you needed to? We live in an age of declining serviceability. People aren’t expected to maintain their own vehicles. Just when you think you’ve seen it all, something new appears to complicate your world. I remember when car windows were manually rolled up and down. That was too much work, so they invented power windows. Life was good. Some vehicles today have computer-controlled window operation. The computer gets confused and you can’t roll your car window down. You have to reboot your window. The added complexity just isn’t worth it. It’s one thing to troubleshoot or replace an electric motor. It’s another when you’re dealing with proprietary software and computer hardware. Troubleshooting is more difficult and repairs can be more costly. Computers have wormed their way into our appliances too. In the old days, a washer had simple switches and dials. Easy to replace. Many washers today are controlled by computers. Is a CPU really required to dry my underwear? I’m not saying we should go back to horses and washbasins. That would be foolish. But needless complexity costs us money for little real benefit. It takes away our ability to service our equipment. It makes us more dependent on others. You can fight to regain a measure of serviceability in two ways. Go with simpler options or learn more, especially electronics. Simpler options are disappearing from the market. Simplicity applies to things that are already simple. Take the humble plate that you eat from. Plates come in a wide range of styles. Some are smooth. Others have intricate work with ridges around the edges. When you pop them in a dishwasher, it doesn’t matter. But, if you wash them by hand, food sticks more easily to intricate patterns and ridges. The same is true of silverware. In a longer-term prepper situation, smooth plates and silverware is easier to wash by hand. This can have real consequences in terms of the time it takes to get them clean and hygienic. Hunters in remote areas often carry bolt action rifles, because it’s the simplest action. The idea is that there are fewer parts to break or malfunction. The bolt action gives you all the firepower you really need. This doesn’t mean we should replace battle rifles with bolt actions. We need to balance the features we get with the level of complexity. When you make an prepper purchase, ask yourself: How serviceable is this thing? The Good News: The economy added 197,000 jobs last month. The Bad News: They were all with the NSA. Just kidding. Turns out there were no full-time jobs created. More than you ever wanted to know about pull-ups. The Gray man concept is popular with many preppers and survivalists. Being a “Gray man” means you blend in. Put another way, the nail that sticks out gets hammered down. You don’t want to be that nail. Most preppers associate “gray man” with wearing earth tones and not carrying obvious fancy tactical gear. The concept goes deeper. It’s about keeping a low profile. It’s about keeping your cards hidden. It’s about living as simple and drama free life as possible. It’s about avoiding confrontations. It’s about keeping your head down and your neck safe. Much of the time, it’s about putting your family first and minding your own business. It’s about listening more than talking. Unlike many sheepdogs, gray men are usually pessimists: They know they can’t change the world and have, to some extent, withdrawn. They’ve seen fellow nails get hammered, and they want to snuggle into the pine. They don’t want to get involved. That’s not a particularly noble or heroic stance. But that’s OK. Gray men are beyond being manipulated by the power of social stigma. One fellow who went anti-gray-man is George Zimmerman. Here was a guy who doesn’t like crime. He decided to get involved. We don’t really know what happened, but one thing led to another. Now he’s on trial for murder, and even if acquitted, his life will forever be harmed. If you wind up on the front page of every major newspaper, you’re not being a gray man. Being an idealist is bad too. Idealists want to do what they see as right and don’t consider the personal consequences. They think they can change the world. In reality, they often just get themselves in a mess. The world rolls on with its agenda. An example is the current situation of NSA leaker Edward Snowden. He thought it was wrong the American government was lying to the American people about monitoring their telephone calls and e-mails. The official position has always been that the NSA only eavesdrops on people outside of America. If somebody outside America talks to somebody inside America, that could be fair game. But, monitoring all domestic to domestic calls was verboten. Secret courts operating under secret rules making secret decisions have secretly decided otherwise. They’ve decided the Fourth Amendment to the Constitution doesn’t apply to secretly tracking Americans. Idealism is great, but now Snowden’s in a pickle. His passport revoked, he’s basically living out the movie script The Terminal, effectively trapped in a Russian airport. If you want to get secret information from somebody, an old-school acronym that is used is MICE. It stands for Money, Ideology, Compromise, and Ego. Some people will sell out for money. Others support a particular ideology or are idealists. A bruised ego can get somebody to spill the beans. Once any of these comes into play, the person is compromised. They can be blackmailed into providing more information. They’ll need to deal their way out. On the negative, maybe the entire American population will be enslaved in the next thirty years as the result of his work. Can’t have everything. The reality is that the vast majority of Americans just don’t care. They want to spend their time watching reality TV. Russia doesn’t want Snowden. He’s an idealist. Given enough time, he’ll be organizing Occupy the Kremlin protests. He’ll be pushing for greater press freedom. Russian officials just don’t want that sort of crap. There were German idealists devoted to the concept of Communism who fought the Nazis covertly inside of Germany. When Russia moved into Germany, these people thought they’d be well treated. They were devoted. The first thing the communists did: Rounded up these people and threw them in prison. Why? Because if these people had the courage to stand up and fight the Nazis, they’d certainly stand up and fight the communist party. A gray man knows ideology is just a front for whatever forces rule a country. We now know the government is collecting metadata on all phone calls and Internet traffic inside America. They’re photographing the outsides of all our snail mail too so they can create a complete map of everybody we know. That contribution you mailed to the NRA, that book you ordered from Paladin Press, and the letter you sent to your daughter in college, all logged for posterity. Over 160 billion pieces of mail a year are photographed. 4. All your bills.. your dentist, your newspapers, your banks, your subscriptions (again). 5. Your outgoing letters (to everybody). 6. 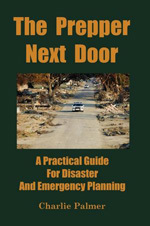 The companies you do business with–including preparedness companies that send you catalogs. 7. All political organizations you’re a member of that send you direct mail. 8. Your church and religious affiliations. 9. All organizations you write checks to or contribute to through the mail. 9. Whether or not you remembered to send your mother-in-law a birthday card! No doubt this data is read by OCR, so it means it can all be put in a searchable database. Using your church as an example, it would be easy to compile a list of all members of that church, by searching all correspondence with the church. Here’s a nice progression tutorial about doing a one-handed pushup. There’s a great article over at TraceMyPreps about not having full access to your money. Hobby welding a small frog, too cute. Reading is good for your brain.